It’s nice to get a second chance. I wrote about Bobby Winkles twice in this blog. He sent me an epic letter, describing what it was like to coach Reggie Jackson in college. Later, he recounted the work ethic and sincere charm of pitcher Nolan Ryan while skippering the California Angels. I asked about everyone but Winkles. He mentioned growing up near Swifton. Swifton is the hometown of Hall of Famer George Kell and his brother Everett “Skeeter” Kell. “I was born in Tuckerman, Ark. 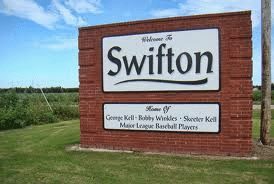 Moved to Swifton when I was 9 years old. Skeeter Kell was one year ahead of me at Swifton High School. We didn’t have baseball. Small school, 19 in my graduation class. Skeeter and I played on the Town team. We played each Sunday when our cotton was plowed for the last time. We played Thursday and Sunday. Skeeter and I were like brothers. George Kell was my idol. he was my teacher in the 7th grade. There’s a 10 by 15-foot sign on the highway honoring the three of us. The only city in Arkansas to have three major league participants at the major league level. Swifton had a population of 520. We also have a three-star general, Billy Paul Bowden. Winkles will be 82 on March 11. I’ve always thought his humble roots would make a good book. He agrees. Coming Monday: a holiday warning for autograph collectors.